Lead (Pb) isotope ratios were measured in the marine macroalga Iridaea cordata collected from four locations in the Windmill Islands, East Antarctica. Based on the masses of thalli collected, samples analysed in this study were likely to be a mixture of one and two year old thalli. For a sample of thalli of various ages (<12 months to 2 years old) from the same site there was no apparent variation in Pb concentration or Pb isotope ratio with thallus mass/age, indicating that contaminant sources had been constant over the lifetime of the thalli sampled. I. cordata samples close to the Thala Valley waste disposal site (Brown Bay Inner) near the Australian Station, Casey, displayed isotopic signatures (208Pb/204Pb 35.99; 206Pb/207Pb 1.066; n = 3; average values shown) trending towards that possessed by major Australian Pb sources(Broken Hill and Mt Isa, 208Pb/204Pb 35.60; 206Pb/207Pb 1.041) suggesting that these samples had been exposed to anthropogenic Pb originating from the Thala Valley waste disposal site. Material collected hundreds of metres from the tip location at Brown Bay Outer had isotopic values (208Pb/204Pb 36.32; 206Pb/207Pb 1.088; n = 10) intermediate between Brown Bay Inner and sites further from the contaminant source at Sparkes Bay and Wilkes (208Pb/204Pb 36.46; 206Pb/207Pb 1.094; n = 4) showing that contaminant transport was predominantly restricted to Brown Bay Inner. 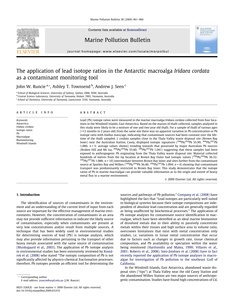 This study demonstrates that the isotope ratios of Pb in marine macroalgae can provide valuable information as to the origin and extent of heavy metal flux in a marine environment.